I share a personal story about how peacemakers in the Kenyan crisis of 2008 depended on metaphysical foundations for their nonviolent engagements. Rachel Wambui Kungu of the Pyramid of Peace recounted their success in convincing the youth at Naivasha, who were armed with machetes, to leave their roadblocks and allow food, medicine and refugees to go through. She thanked me for the precepts I had taught her, such as "Be vulnerable". Instead of driving up in a car, her team went on motorbikes, which put the youth at ease. In Chicago, I and Joe Damal had distilled our personal experience engaging gangs into an overall principle, "Always look at everything from their point of view", and seven related precepts: Be straightforward, Don't skip steps, Be vulnerable, Let them win, Let them teach you, Stick to your principles, and Have something to share. But I needed metaphysics to assure myself that these precepts were so correct and so complete that we could depend on them with our very lives. How does it seem to me? Be straightforward. What else should I be doing? Don't skip steps. Would it make any difference? Be vulnerable. What do I have control over? Let them win. Am I able to consider this question? Let them teach you. Is this the way that things should be? Stick to your principles. Am I doing anything about this? Have something to share. A teacher once asked me, How do you know you're not a robot? and I realized that I could best respond to such a doubt with a counterquestion, Would it make any difference? A workshop participant once asked me, How do we know you're not brainwashing us? and so I collected such counterquestions. Six of them appear in Jesus's antitheses in his Sermon on the Mount. 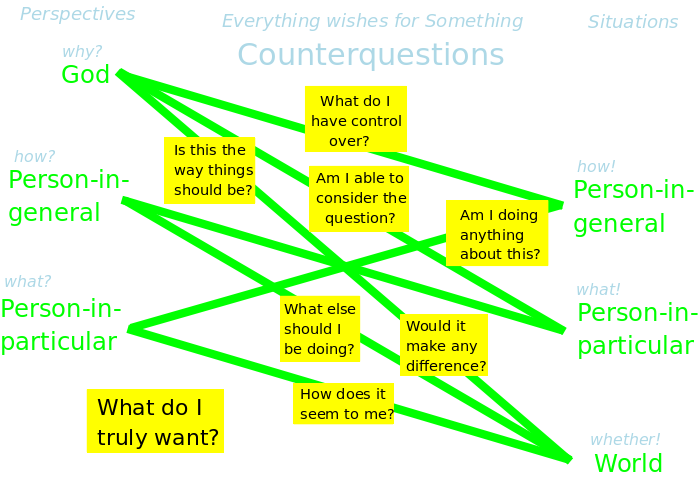 Ultimately, I realized that I could generate the seven counterquestions by imagining a perspective (of a person-in-particular, a person-in-general, or God) upon a situation (of the world, a person-in-particular, or a person-in-general). Would it make any difference? arises when a person-in-general looks at a person-in-particular's situation. If the perspective and situation differ, then there are seven possible counterquestions, forming an exhaustive and compelling system.